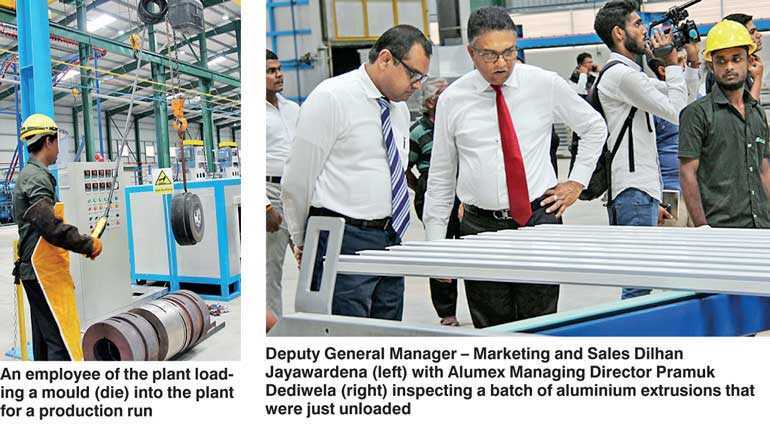 Aluminium extrusions producer, Alumex, recently unveiled the country’ first fully automated, front-loading aluminium extrusion plant and South Asia’s first vertical powder coating facility with patented SAT Travisan CUBE Technology in Ekala, Ja-Ela. The Rs. 2 billion mega project—located at No. 138/ 4, Minuwangoda Road—will officially make AlumexPLC the largest aluminium extruder in Sri Lanka in terms of scale and output. A subsidiary of Hayleys PLC, will hire more than 185 people to ensure that the plant outputs an incredible 1,000 MT in aluminium extrusions and powder coating per month. The plant will house the largest aluminium extruder in Sri Lanka. The Italian-made Presezzi 23 meganewton extruder will consume far less energy compared to other extruders currently available in the market. Alumex will also benefit from its automated downstream equipment and long run-out tables with infrared and Bluetooth technology controls. This powder coating plant will be equipped with advanced autonomous machinery for economical operation and high efficiency. A complete powder recycling facility with 100% recovery will also mean no powder wastage in the powder spraying process, reducing the cost of production to a great extent. The firm will also leverage smart operating platforms with online error correction facilities. The highlight of the plant is in its reduction of waste water and purification system to make certain that water discharge has zero impact on the local environment. With eco-friendly non-chrome chemicals in the mix, proprietary systems will help ensure that Alumex products are tested for, water penetration, air infiltration, wind pressure (deflection) and sound to facilitate the firm’s 30 year promise.